The introduction of 512-gigabyte options in the Phone XS and iPhone XS Max, far above the 256 gigabytes offered in the largest-capacity iPhone X, arrives with relatively high charges for the upgrade. According to Bloomberg, the price difference translates to an extra $134 in profit per iPhone sold with 512 gigabytes of storage compared to the smallest 64-gigabyte option. It is also claimed the $134 profit difference has increased from 2017's releases, where the revenue change between the smallest and highest-capacity iPhone X models was $107. 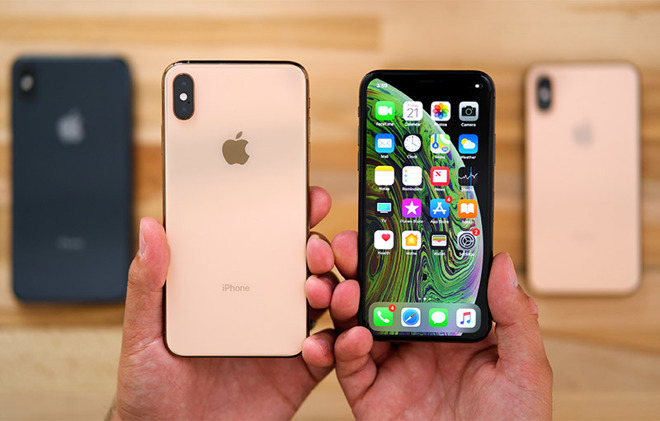 "Storage is one of their levers to create more revenue and is absolutely the most profitable iPhone feature," IHS Markit researcher Wayne Lam advised. There is no additional work for Apple to perform to increase the capacity, Lam reasons, because it is simply a chip swap, "whereas when you increase the screen size, you have to completely re-engineer the phone." Lam suggests Apple pays approximately 25 cents per gigabyte, but charges consumers approximately 78 cents. The profit increase is largely due to the bigger memory capacity option, which to consumers represents a $350 jump in price between lowest and highest-capacity models, but to Apple is an alleged memory cost difference of between $23.69 and $132.48. Aside from failing to offer consumers some level of per-gigabyte discount by opting for the higher capacity, price savings in Nand flash memory chips are apparently not being passed to consumers, despite the market price apparently down to half of the cost from 2017. It is suggested that Apple's contracts to "lock-in" the price of components from suppliers may in fact be working against the company in this case, as it may still be paying at older, higher rates for memory when it could be sourced for far cheaper. It is also posited that owners of larger-capacity devices offer other revenue sources to Apple, due to the ability to put more music, videos, and apps onto their handsets. It is claimed an owner of a 512GB iPhone XS Max could spend at least $40 a month more to Apple for an iCloud subscription for backups, Apple Music, and buying one iTunes movie per month. Reports that rely on BOM (bill of materials) estimates should generally be taken with caution, as they are purely estimates based on the market value of components used inside devices by analysts and think tanks, rather than an actual price list for parts, There are many reasons why the component prices can vary, including economies of scale, manufacturing challenges, scarcity of required materials, and even the contract between the supplier and Apple itself. The BOMs also typically do not take into account other costs, including assembly and the initial research and development of the hardware by Apple itself. Short of Apple itself confirming how much it costs to produce each iPhone —a figure that will never be supplied by the company —no-one outside the company will ultimately know the exact figure.